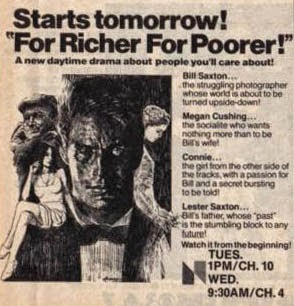 1977: For Richer, For Poorer premiered on NBC. 1979: A mystery person tried to enter The Willows on ATWT. 1989: Guiding Light's Phillip tried to get through to Beth. 1995: Y&R's Ryan pitched a new Jabot ad campaign for teens. 1966: On Dark Shadows, Burke Devlin (Mitchell Ryan) realized that Victoria Winters was still at Collinwood. 1974: On General Hospital, Phil Brewer (Martin West) was murdered with a geode paper weight. 1974: On Another World, when a bitter and tearful Rachel Davis (Victoria Wyndham) told her mother, Ada McGowan (Constance Ford), that she would never love anyone but Steve Frame, Ada urged her to find someone new. Later, Rachel broke down with Mackenzie Cory (Douglass Watson), which led him to cancel his dinner plans with Liz Matthews at Pat and John Randolph's house. Instead, Mac took Rachel (Victoria Wyndham) out to dinner at Tallboys, listened to her life story, and advised her to give up on Steve and make new friends. 1977: For Richer, For Poorer, the revamped version of NBC daytime soap opera Lovers and Friends, debuted. 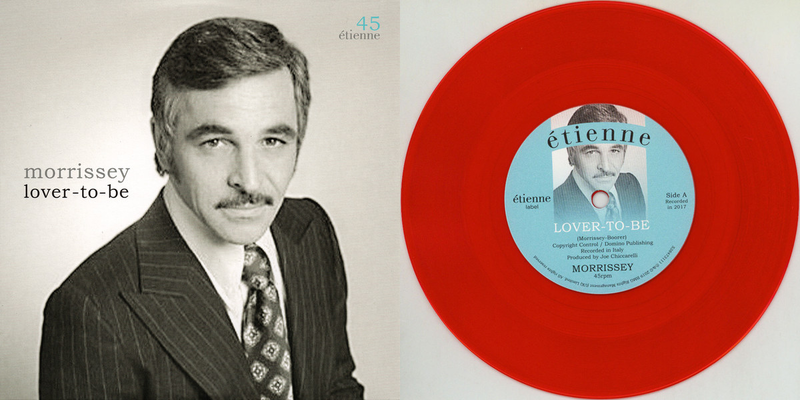 Created by created by Harding Lemay and Paul Rauch, Lovers and Friends replaced Somerset in the NBC lineup in 1976. When the retooling occurred, the show's setting was still Point Clair but many changes were made to the storylines. For Richer, For Poorer only stayed on the air until September 29, 1978. 1977: On Ryan's Hope, Rae (Louise Shaffer) visited Jill and Seneca and told them the papers would be taking a position against them in the strike. 1979: On As the World Turns, a mysterious person wanted a frightened Lisa Colman (Eileen Fulton) to let them in the front door of The Willows. 1983: On General Hospital, Luke and Laura Spencer, and Rick and Lesley Webber, threw a party at the mayor's mansion for all of Laura's friends and family, believing Stavros had left town and Laura was now free of the Cassadines. An ecstatic Amy arrived and was reunited with Laura, followed by Brian and Claudia, then Monica. Holly and Robert arrived and Luke introduced Laura to Holly. Slick and Emma Lutz arrived and were thrilled to see Laura again. Ruby and Bobbie embraced Laura when they arrived. Holly remarked that she had never seen two people as happy together as Luke and Laura were. Laura met Blackie, and reunited with Mike, Jake and Rose. Later, a carefree Luke tended to the grill, unaware Stavros was watching. 1984: On Another World, Cass Winthrop (Stephen Schenetzer) pulled Kathleen McKinnon (Julie Osburn) into a kiss. 1985: On General Hospital, Felicia Cummings (Kristina Wagner) surprised Frisco Jones (Jack Wagner) with a trip to the jewelry store, the perfect place to pick out an engagement ring. Frisco was taken aback at her proposal, and disappointed her when he said they needed to be practical and not spend his royalty check on an expensive ring. Later, Frisco surprised Felicia with the ring that she had liked, and the two became officially engaged. 1988: Actor Timothy Patrick Murphy died at age 29. He played Mickey Trotter on Dallas and Spencer Langley in Search for Tomorrow. 1989: On Guiding Light, Phillip Spaulding (Grant Aleksander) tried to get more information from Beth Raines (Beth Chamberlin). 1995: On The Young and the Restless, Ryan McNeil (Scott Reeves) pitched a new ad campaign to Jill Abbott (Jess Walton). 1998: Emmy-winning actor Michael Zaslow passed away at age 54. Best known for his Emmy-winning performance as Roger Thorpe in Guiding Light, Zaslow's other soap roles included David Renaldi in One Life to Live, and Pete Chernak on Love is a Many Spendored Thing. The clip below is from the 1999 Soap Opera Digest Awards, where a special editor's award was presented to Zaslow's wife and daughters as part of a tribute to his career. 1999: Actor Ed Bryce, father of Scott Bryce, died at age 78. He starred in Guiding Light as Bill Bauer for many years. He also played Professor Philip Stallings on As the World Turns, and Phil in Somerset. 2010: ABC aired the first 16:9 widescreen picture format episode of One Life to Live. In the episode, Eddie Ford (John Wesley Shipp) held Nora Buchanan (Hillary B. Smith) hostage.